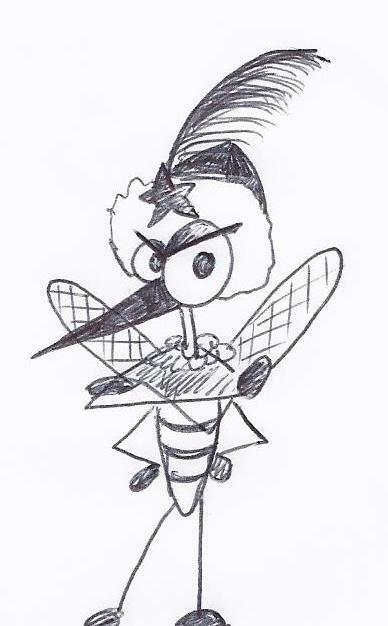 For Inspiration Avenue, I submit a cartoon of Vlad, The Ice Mosquito. Oooh, he looks ticked, lol. Great entry. I would not want to meet Vlad in my yard, although I've had a lot of them visit me this summer. Really cute challenge sketch. Vlad looks as if he is searching for his next victim. Very cute! Vlad is totally cute...and I think he was at my picnic table last night! I got quite a kick out of this guy! and the name, "Vlad".. makes me think of Vlad the Impaler, very appropriate considering he's a blood sucking mosquito! Thanks for entering the challenge. Great character - what a wonderful entry for this theme! I love your whimsical and very expressive character. Blessings!